The secret to avoiding food boredom when eating paleo or on a Whole30? 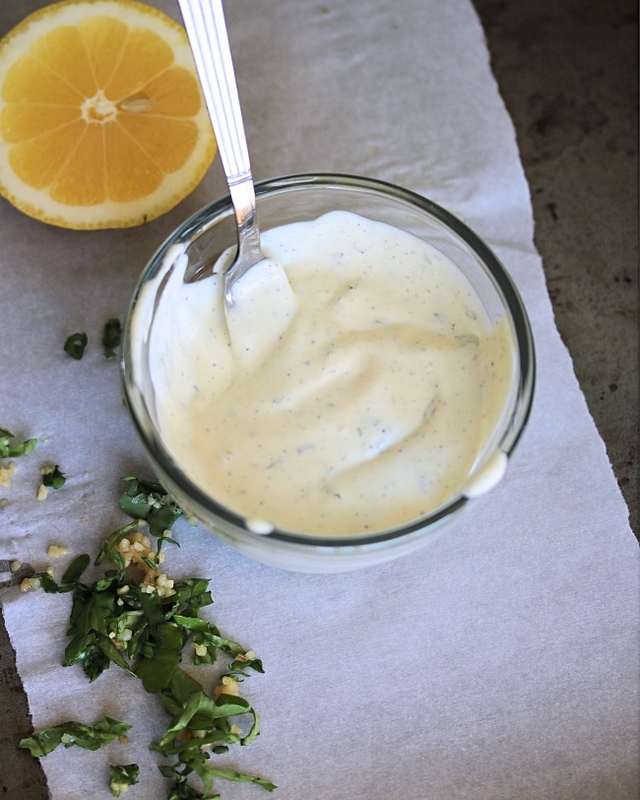 Hands down: sauces, dips, spreads, condiments... you get the gist. 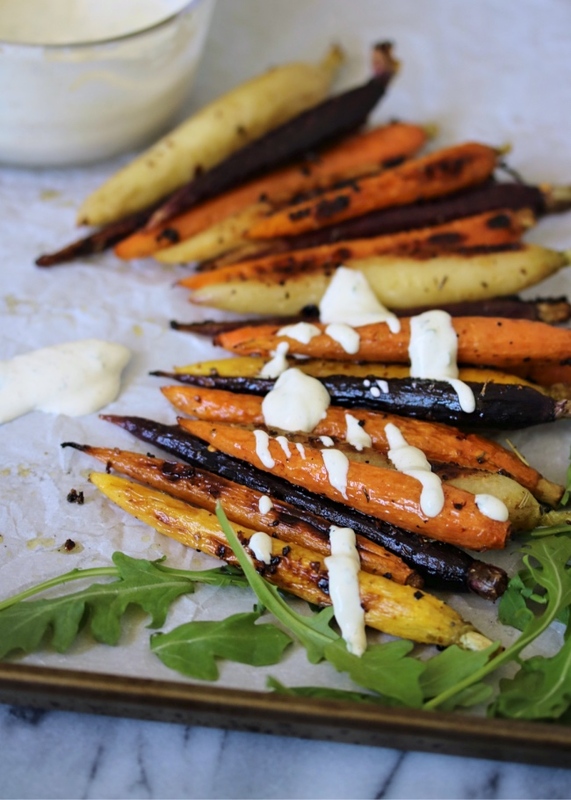 Anything that turns a basic roasted veggie or grilled protein into something delicious that you will crave! I use each with moderation, of course, but still find that even the lightest drizzle of a flavorful sauce can add SO much "oomph" to any simple meal. From crab cakes to raw veggies to burgers to oven fries... 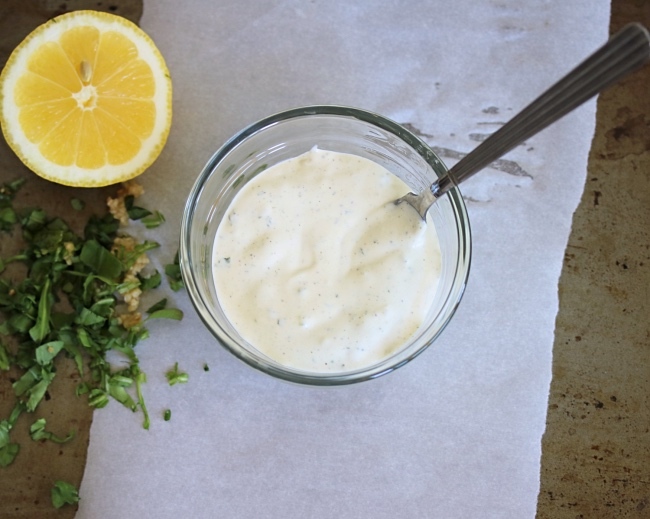 This aioli has become our go-to because it's flavor goes with everything, and we put it on everything. It's creamy, garlicky, and so, so versatile. 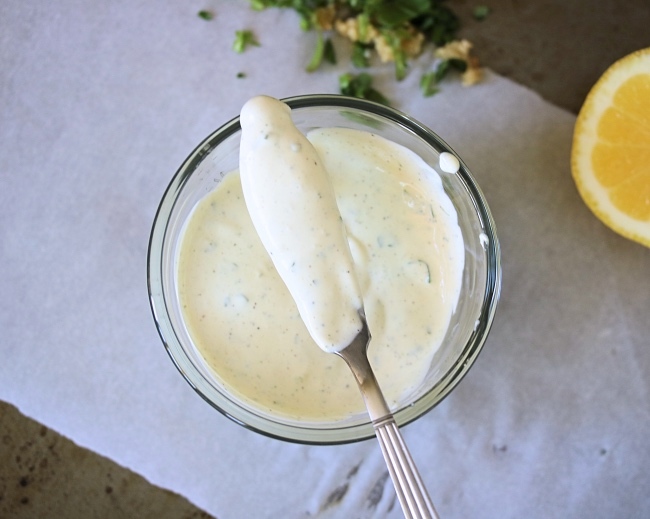 This from-scratch "aioli" is a simplified version of the authentic 'real deal' - which is typically done much more artfully with a mortar & pestle to grind the garlic and salt into a paste. That is then mixed with egg yolk, and oil is whisked in slowly while the heavens sing. And while I absolutely appreciate going to amazing restaurants where the time is taken to make recipes such as these in their classic form ~ it's not super realistic for day-to-day life: when I really just want to have easy aioli that I can make whenever so that I can put it on whatever. So here I am with the blender version. 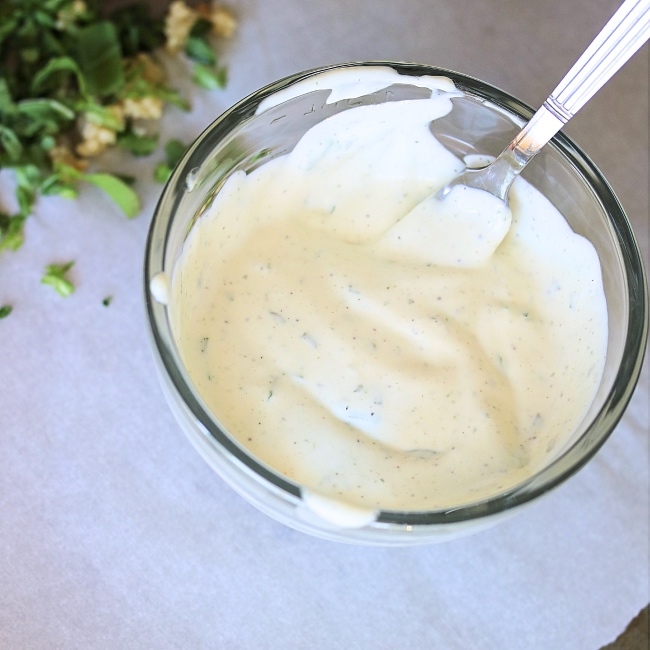 It gets the job done quick, the flavor is on point, and the texture is a creamy mayo-like consistency that holds up as a dip but drizzles just as well... so it goes with any dish. 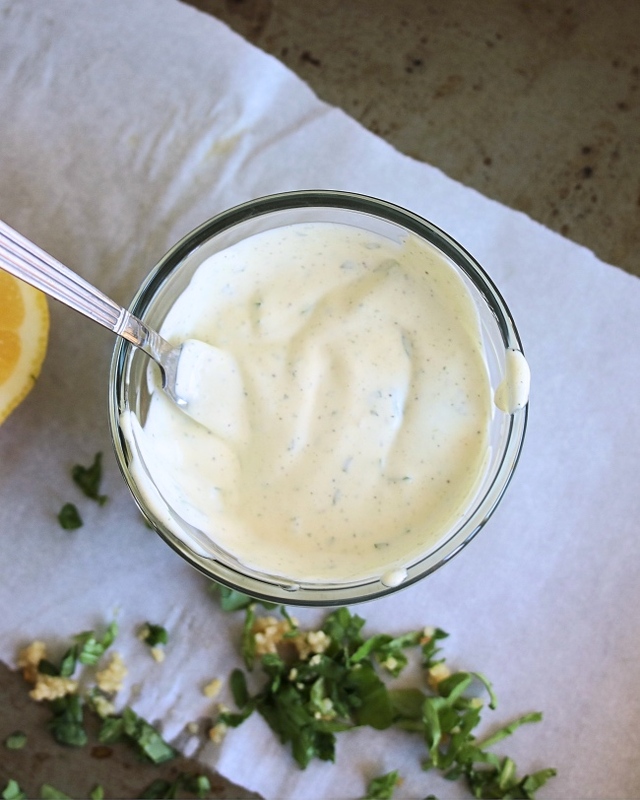 If you're ready for a practical dip/spread/drizzle/sauce that you can put on pretty much everything, you've come to the right place! I hope you enjoy this as much as we do, and I look forward to hearing about your favorite ways to use it! To a blender*, add the oil, coconut milk, and egg. Process until evenly combined. Add the garlic, parsley, salt, pepper, Dijon, and lemon juice. Continue to blend until combined and thickened to a mayo-like texture. Refrigerate in a covered container for up to 3 days. I prefer avocado oil's mild flavor for this recipe, but you could substitute olive oil or another oil you have on hand. The taste will be slightly different depending on which you use. You could use a blender, food processor, or bullet-type blender for this. We use the Nutribullet because it's easy & quick to clean. Tip: Make this your own by adding whatever dried herbs & spices or flavors you like (chili powder, chives, roasted red peppers, hot sauce, dried onion). You could also add the infamous Trader Joe's "Everything But the Bagel" spice blend for some serious everything flavor! I have been meaning to put in writing something like this on my website custom dissertation writing service and you have given me an concept. Cheers. OMG, Jessie, I made this tonight as spur of the moment sauce for some seasoned shrimp. My sister and brother in law came over for dinner unexpectedly and I hadn't planned on this. So my first thought, how about some type of cream sauce, I'll just look at Jessie's recipes, I bet she has something out there. So glad I did. I made your aioli sauce and added my little twist to it and mixed it with the seasoned shrimp and it was delicious. Thank you!! !